Updated for both Python 3.4 and 2.7, this convenient pocket guide is the perfect on-the-job quick reference. Youâll find concise, need-to-know information on Python types and statements, special method names, built-in functions and exceptions, commonly used standard library modules, and other prominent Python tools. The handy index lets you pinpoint exactly what you need. 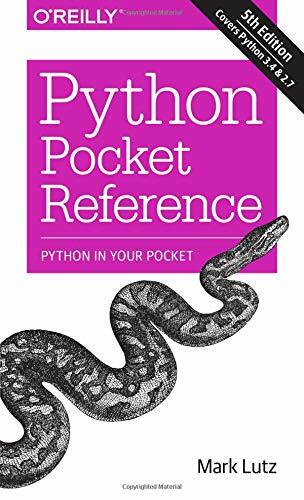 Written by Mark Lutzâwidely recognized as the worldâs leading Python trainerâPython Pocket Reference is an ideal companion to OâReillyâs classic Python tutorials, Learning Python and Programming Python, also written by Mark. 5th edition from Oreilly & Associates Inc (February 9, 2014); titled "Python Pocket Reference"
About: Updated for both Python 3. About: This is the book to reach for when you're coding on the fly and need an answer now. from Oreilly & Associates Inc (February 28, 2005); titled "Python Pocket Reference"
About: Python is optimized for quality, productivity, portability, and integration. 2 sub edition from Oreilly & Associates Inc (November 1, 2001); titled "Python Pocket Reference"
About: Python is a popular object-oriented scripting language that is freely available over the Net.